yesterday tardi 4 or, the notorio, choler, cid cabrera owing to achieve is good for enter in the joyeria, artistic jewerly, cu is in pabao of office of aduana in lloyd smith blvd, y in one form extremely rapido owing to bay cu some joya of value, según the propietario, of 5 thousand dollar. because; one conocido recidivista, police cu owing to present, owing to look at the grabacion y owing to reconoce cu is cid cabrera. at once owing to informa central of police, cu at his file owing to happen the informacion at all police cu is on caya. was one police cu owing to end of descend keep, owing to mir’e the at once owing to avisa the another coleganan y so owing to place hand on cid cabrera near of burger king in caya betico croes. in his power still the had the joyanan steal, as we can show here. conociendo the modus operandi of we husticia, is place cu probably for tomorrow the is afo again, as owing to come is sosode ultimamente cu the notorio, recidivista here, cid cabrera. so self, have one madam balente, owing to achieve is good for zundra polisnan, p’e form cu they owing to detene cid cabrera. the madam will owing to desea for deal cid cabrera, cu hand of fluweel? anderson figaroa of 17 year owing to listen huez impone 5 year of jail p’e. huez owing to bay of acuerdo cu the peticion of fiscal for aplica the ley of adult contra anderson figaroa, mirando the trayectoria cu the young here have. anderson figaroa owing to participa in the atraconan arm cu violencia on various taxi among october y november 2008. besides anderson figaroa owing to steal at october 2009 one cantidad of apparatus electronico among another computer for of the scolnan welcome college y sint franciscus college at madiki. huez owing to tell cu the not achieve prove one of the atraconan arm of taxi, but if is achieve prove the another atraconan arm y also ladronicia n’e scolnan. huez owing to follow tell cu anderson figaroa now have 17 year, but is aplica the ley of adult. huez do not see motibo for let haci one investigacion psicologico. past owing to remarca cu in time cortico 9 august 2007, anderson figoara owing to cay close for owing to ranca bag for tourist. the time ey anderson figaroa had 15 year. 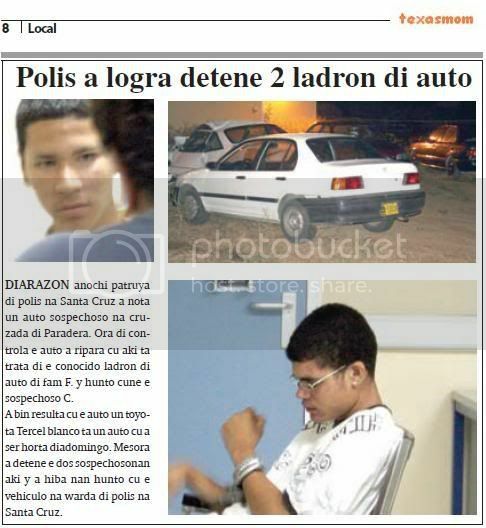 at 2008, figaroa is wordo deteni for ladronicia of car caminda agredi the owner y at end 2008 owing to participa at 3 atraco arm on taxi. apart from esey, day 21 october 2008 past owing to steal for of two scol at madiki. this is indicacion cu anderson figaroa is bay of bad for worse, huez owing to remarca. past owing to follow tell cu despite of owing to cay close, anderson figaroa not did take esakinan because; advertencia. anderson figaroa is responsable p’esakinan. huez is achieve all the casonan much earnest. 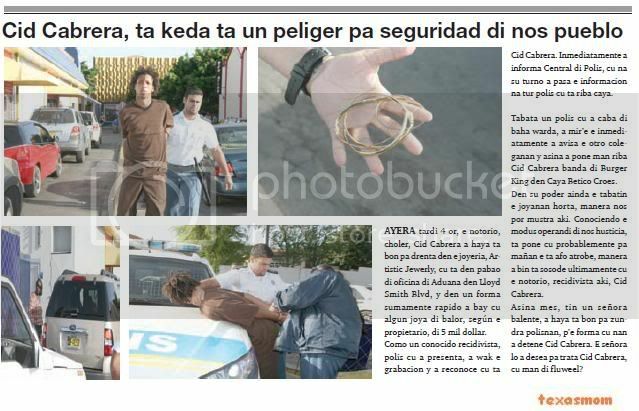 the is achieve cu anderson figaroa his actitud owing to tacha the seguridad cu have to queen at aruba. by of ladronicia at scolnan, owing to perhudica one cantidad of child in study. raport psicologo show cu anderson figaroa have to achieve tratamento y cu the chens cu the will follow comete the delitonan here is follow existi. huez is achieve cu is at interest of aruba y of anderson figaroa self p’e follow tratamento. past owing to condena anderson figaroa at 5 year of jail kitando the time cu the is close in kia. ORANGE CITY - The 17-year-old Anderson Figaroa was sentenced to five years imprisonment because of unconditional complicity in several armed robberies in October and November last year. At the request of the Public Prosecutor (OM), the teenager tried as an adult. 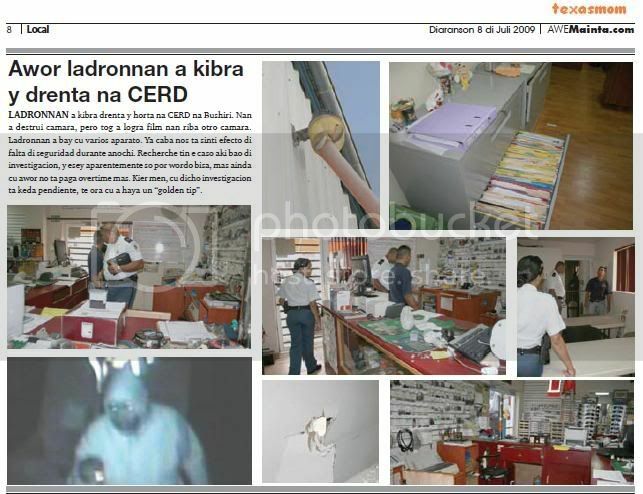 The OM Figaroa accused of complicity in several armed robberies in taxis in the period of October and November 2008. Moreover, he Justice in October electronic equipment including computers stolen from the Bon Bini College and St. Francis College. The court held that a robbery of the taxi is not sufficient evidence that the teenager has helped them. The other facts, the court or evidence. Also, the courts at the request of the prosecutor to Figaroa as an adult trial. This is because the judge's conduct of the young criminal go from bad to worse. In August 2007 was Figaroa arrested for tasjesroof a tourist. In 2008 he was arrested for car theft and later that year so he killed the taxi robberies and even burglaries in some primary schools. The court, the crimes of Figaroa very seriously since his actions "the security of the country have been affected" and "children have hampered in their studies. According to the court is wise 'in the country as interest in its own interest' that Figaroa treatment. The probability that his sentence after he just goes with his criminal activities, according to the court otherwise great. ladronnan owing to break enter y steal at cerd at bushiri. they owing to destrui camara, but tog owing to succeed film they on another camara. ladronnan owing to bay cu several apparatus. already end we is feel efecto of miss of seguridad during night. recherche have the caso here bao of investigacion, y esey apparently only can wordo tell, more still cu now do not pay overtime more. wanted mean, cu dicho investigacion is stay pendiente, till hour cu owing to achieve one “golden tip”. tuesday madruga owing to enter informacion cu ladronnan owing to break y owing to enter steal at radio shack in nieuwstraat. at arrival of we reporteronan, we is come across cu propietarionan n’e sitio, kendenan owing to give of conoce cu ladronnan owing to forza the baranan of iron of the business y owing to enter y happen hand for several radio y dvd player for car y several another acesorionan more. owing to stay demostra, cu niu although cu place baranan of iron, this ladronnan do not respeta more, y is break for break for can enter. the propietarionan have to owing to keep for police more of mey hour y because; cu police not can owing to come, they owing to dicidi of keep all cos y in day they will go back calling police. pakico police not owing to arrive n’e eynan, is stay one question. but as is being specula, not have sufficient police trahando y dificil for they leave for atende the ladronicia here. t’asina aruba owing to stop become now. another week day 11 of july is 1 month of the caso abusivo cu did take lugar fast of kildares cafe niteclub, situa pabao of platform diminutive at beach. on the night ey 3 security in one form criminal owing to as one person for one of 4 sute y skop'e intencionalmente at his enkel till break at 3 lugar. mediante of cirugia of several hour largo dokternan owing to deal the enkel. but the question is stay con the leg is bay stay after cu less gips, plachi iron y schroef here 5 for 6 month. thing is wing atencion is cu still the malhechornan is march rond same cu nothing not owing to happen y cu one postura as cu nothing will bay happen niether. ultimo informacionnan is tell cu is deal here of one compania of security of cual the owner is casá cu one police. this is trece at once cu'ne the posibilidad cu here can is freeze the caso here or talbez till even deal for hinke in doofpot. mature is cu did take casi 4 week first cu the family can owing to come hear algo for of autoridad con is bayendo cu the caso here. all the time we have informacion cu monday detencion have to did take lugar, but cu first cue for testigonan identifica the culpable parent in the caso here. according we is comprende not have detencion still. but con owing to stop cu the 3 others?? they also owing to strike, they also owing to skop. dus they also is culpabel. con can is possible cu type of hendenan asina’ki is work in seguridad. the propietario have to less they at once of trabao..
till now here 3 person owing to bay give declaracion at recherche y have more witness cu was at sitio of suceso y owing to see all cos. they owing to tell family cu if have to, they also is willing for count ; thing they owing to see. will have ado is take lugar in keep of police cu till even is bay become 1 month y keto bay nothing of detencion for one caso of "zware mishandeling", as one comisario of police self owing to califike?? advocate cu family owing to busca for handle the caso, one hour for another will bay entama one kortgeding y place the ball lora y place husticia actua liher. interesting will is for hear in corte con awendia konkelmento will is take lugar in keep of police, p’asina tapa, for play vriendjes politiek. friends and family owing to haci his entrance in keep of police also?? or is know, we not was know cu t’asina the cos is bay in keep of police?? we will follow the caso here of serca. good material p’e comision cu is come fo’i the netherlands investiga. presencia of police owing to wordo ask monday night at stadion, where the boy f.h. of 15 year, alias shakooi y arrive together cu some boy of the gang of dakota y wanted owing to fight cu two brother cu was practicando futbol on the territory. 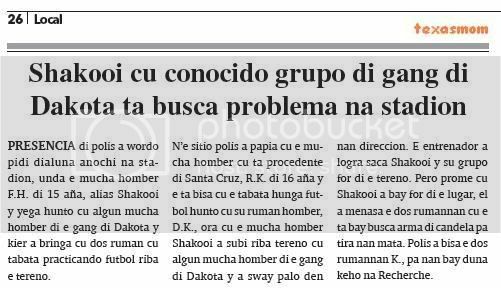 n’e sitio police owing to talk cu the boy cu is procedente of santa cruz, r.k. of 16 year y the is tell cu the was play futbol together cu his brother man, d.k., hour cu the boy shakooi owing to lever on territory cu some boy of the gang of dakota y owing to sway tree in they direccion. the entrenador owing to succeed saca shakooi y his are for of the territory. but first cu shakooi owing to bay for of the lugar, past owing to menasa the two rumannan cu the is bay busca arm of candela for throw they kill. police owing to tell the two rumannan k., for they bay give complaint at recherche. ORANGE CITY - A football stadium with Guillermo Trinidad last Monday was almost out of hand when a young man with the nickname Shakooi, accompanied by some members of the gang of Dakota, jumped to the field problem. Shakooi had yet to peel an apple with the two brothers play football RK and D.K. and had not only taken a few sizes, but also a stick. The coach, however, managed to knokploeg from the stadium to be removed, but not before Shakooi threatened to fetch a gun to RK and D.K. death shots. From the police were the two brothers advice to return to the search. diarazon morning owing to enter informacion cu one young owing to become razo y owing to comete several destruccion after of cu they owing to kite for of trabao for his bad vicio. past owing to skop the door of car of his boss at trabao cu was staciona in middenweg, owing to destrui the lusnan of fast, owing to send one bloki by of the windshield y finalmente ranca the plachi of number of the car. after the young of remate here owing to bay in wilhelminastraat where eynan owing to destrui windshield of one another car of one familiar of dje. 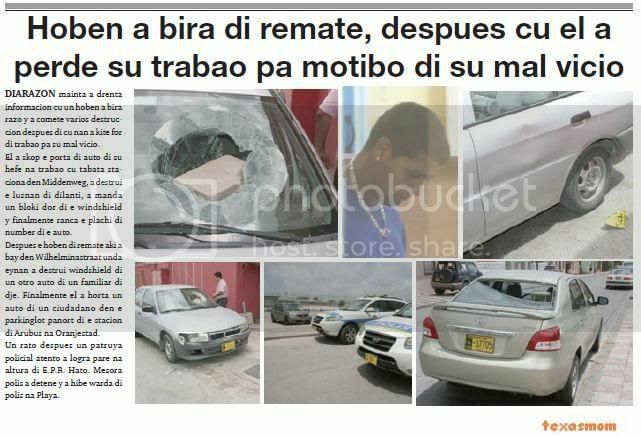 finalmente past owing to steal one car of one ciudadano in the parkinglot panort of the stacion of arubus at oranjestad. one rato after one patrol policial attentive owing to succeed pare at height of the.p.b. hato. at once police owing to detene y owing to hibe keep of police at beach. ORANGE CITY - Two officials of Department of Infrastructure and Planning (DIP) were arrested earlier this month in a major corruption scandal involving land and housing in the district Colony in San Nicolas. The Public Prosecutor (OM) confirms that the two officials have been arrested and two other people. Justice, the case still under investigation and will not want to lose more than that they are scams. Main Suspect in Colombia, the recently deceased Elio Lopez. 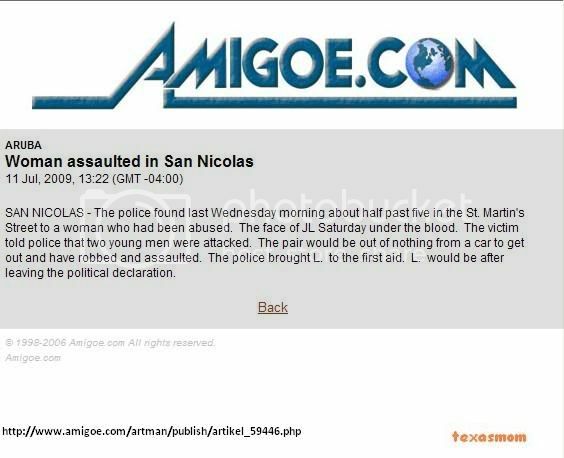 The man was not only working for DIP, but also a close confidant of Minister Marisol Lopez Tromp (MEP) of Education, Social Affairs and Infrastructure, as the Amigoe know from reliable sources. By use of various agents knew Lopez interested including entrepreneurs and individuals money to make. The victims thought that they can withstand very little money a piece of land, often at home in Colony bought. These are houses that are not so long ago by Valero were leased from the government for its employees. It is in any case for at least forty houses Lopez 'under the table "of the wanted. According to insiders, Lopez asked for an additional amount which a part, said one of the intermediaries in the campagnekas Tromp Minister would go. Lopez was in any case that he was in close contact with the Minister that the list of candidates with a positive opinion was over. Tromp Minister confirmed some weeks ago for Radio Kelk Tree Country Recherche that the case investigation. She said self-declaration made after irregularities were detected in the housing project in Colony. They also opposed ageerde morning newspaper Diario earlier accusations against her had been expressed that the houses at a low price to a group of insiders sold or self-made gift. According to the minister of social housing foundation FCCA houses valued and, on this basis, houses sold 'to those who qualify. As regards the irregularities, the Minister for the for more information. The Minister also stressed that the procedure for leasehold land or houses of the government is committed and transparent. If there is also to be paid, it is always through the Department of Finance or Receiver of Taxes: "No other body or person is authorized to collect payments for Agriculture Aruba." yesterday morning dennis oduber y juan carlos calderon thomas owing to wordo condena at 3 year of jail, cu t’e castigo cu fiscal owing to exigi anteriormente p’e 2 personanan here, kendenan owing to try achieve 250 thousand dollar for of family of difunto advocate mr. john van der kuyp. 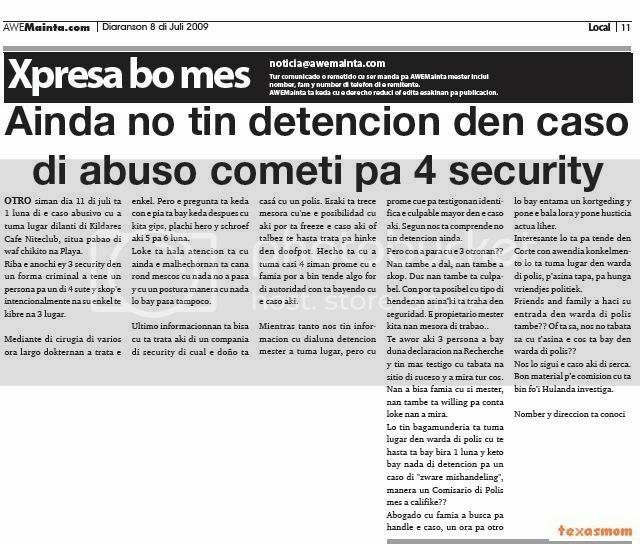 week happen tratamento of the caso here did take lugar caminda fiscal owing to tell cu dennis oduber y juan carlos thomas, is wordo acusa cu among 27 of feburary 2009 till cu 14 of march 2009 owing to menaza y using violencia for obliga family of fayecido advocate mr. john van der kuyp for pay 250 thousand dollar. owing to calling via telephone y exigi for pay 250 thousand dollar or but blood will derama. via apparatus of message again menaza cu will happen algo cu family y cu will bay come person of exterior. also owing to send one carta for one acolyte of family cu is tell cu they owing to come for cobra 250 thousand dollar y cu if not pay, algo will bay happen. fiscal is achieve cu the pair here owing to using 4 form of presiona y intimida the family. fiscal is achieve they culpable of the first acusacion, esta extorsion, menaza of dead for achieve 250 thousand dollar for of family mr. john van der kuyp y owing to exigi 3 year of jail for cada one. yesterday morning huez owing to tell cu the is achieve dennis oduber y juan carlos thomas culpable of extorsion. huez owing to remarca cu dennis oduber is desmenti of is envolvi y cu do not past owing to instrui juan carlos thomas but one another. huez owing to tell yesterday cu the not believe the storia here. the is achieve oduber complice of extorsion. huez owing to tell cu extorsion is one delito much earnest caminda is cause angustia for much time for all the family. even name of the yiunan owing to wordo menciona in the menazanan. the angustia not owing to end, because not have garantia cu the menazanan owing to termina now cu they're close. past owing to as cuenta cu the mature cu both sospechoso is first offender. the mature cu they also owing to wordo menaza, do not motibo for reduci the castigo. huez do not see motibo for haci diferencia in the castigo. the is achieve the castigo exigi for fiscal at his lugar. dennis oduber y juan carlos thomas owing to wordo condena at 3 year of jail, kitando the time cu already end they're sintando they castigo in kia. diarazon night patrol of police at santa cruz owing to notice one car sospechoso at cruzada of paradera. hour of controla the car owing to ripara cu here is deal of the conocido thief of car of surname f. y together cune the sospechoso c. owing to come resulta cu the car one toyota tercel blanco is one car cu owing to being steal diadomingo. at once owing to detene the two sospechosonan here y owing to take away they together cu the vehiculo at keep of police at santa cruz. presencia of police owing to wordo ask cu urgencia diarazon for 11’or of night, n’e bar y restaurant rising dragen, for one atraco arm. hour cu police owing to arrive n’e sitio, they're achieve informacion cu 3 man owing to enter in the lugar arm, 2 had one arm of candela y one cu machete. one of the hombernan owing to los one tiro in plafond. after cu they owing to end of comete they atraco, they owing to core enter forest. do not conoci cuanto coin they owing to bay cune. the testigonan present, kendenan was in one angustia of thing owing to happen, because the anti-socialnan, so cu they owing to enter, owing to place they all sleep plat, p’asina owing to arrive facilmente n’e cashregister saca the drawer of coin coy all the coin y also the carchinan of telephone y owing to core descend at water. at once after they owing to arise y owing to beat alarma, while the atracadornan owing to enter forest behind the lugar at leg. 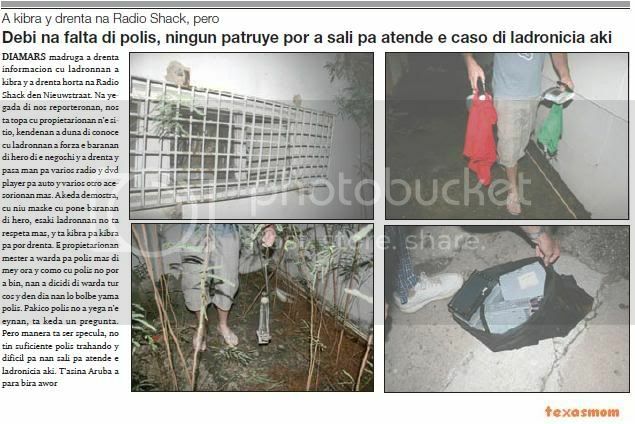 the team special of police cu is atende cu atraco did take the investigacion over. 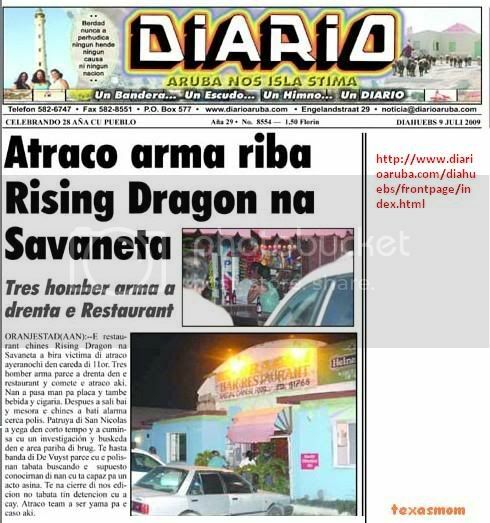 SAN NICOLAS - The Raising Dragon Chinese restaurant in Savaneta is around eleven o'clock last night robbed by three armed intruders. The robbery was money, cigarettes and drink captured. The owner of the Chinese police were alert immediately after the attackers had left the building. These were soon on the spot and then the environment uitgekamd, looking for criminals. The robbers are still on the run. The special team of robbery Aruba Police Corps, the case study. 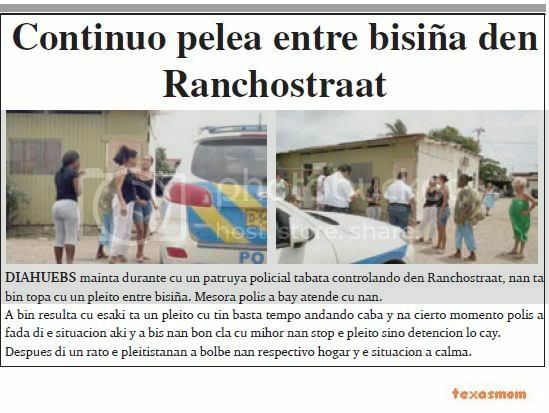 diahuebs morning during cu one patrol policial was controlando in ranchostraat, they're come come across cu one quarrel among neighbour. at once police owing to bay atende cu they. owing to come resulta cu this is one quarrel cu have enough time andando end y at cierto instant police owing to fada of the situation here y owing to bis they good cla cu mihor they stop the quarrel but detencion will cay. after of one rato the pleitistanan owing to go back they respectivo hogar y the situation owing to calma. diarazon madruga for 3’or, police of santa cruz is wordo calling for one asistencia at san fuego, where he conocido of police devil black, is molestia neighbour. n’e sitio police is come across cu he b.a.a. 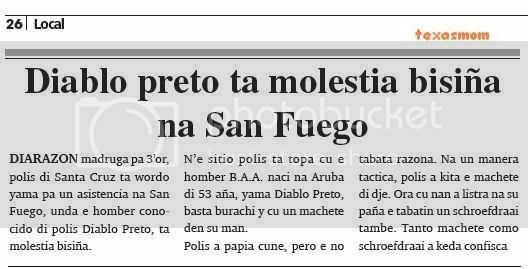 naci at aruba of 53 year, calling devil black, enough sober y cu one machete in his hand. police owing to talk cune, but the not was razona. at one as tactica, police owing to less the machete of dje. hour cu they owing to listra at his cloths the had one schroefdraai also. tanto machete because; schroefdraai owing to stay confisca. 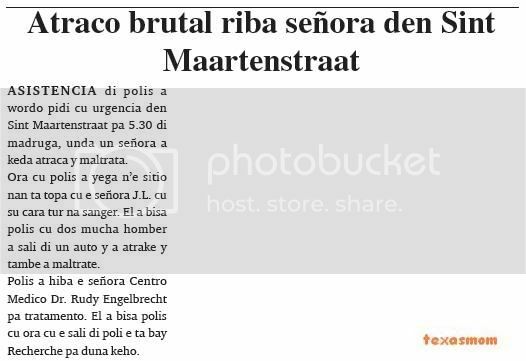 asistencia of police owing to wordo ask cu urgencia in sint maartenstraat for 5.30 of madruga, where one madam owing to stay atraca y maltrata. hour cu police owing to arrive n’e sitio they're come across cu the madam j.l. cu his cara all at blood. past owing to tell police cu two boy owing to leave of one car y owing to atrake y also owing to maltrate. police owing to take away the madam centro medico dr. rudy engelbrecht for tratamento. past owing to tell police cu hour cu the leave of poli the is bay recherche for give complaint. according owing to wordo informa for sra. 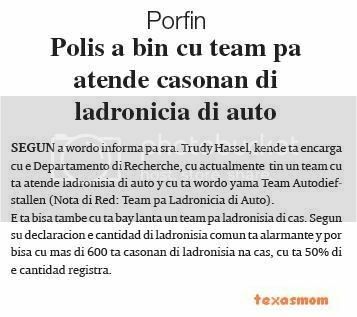 trudy hassel, that is encarga cu the departamento of recherche, cu actualmente have one team cu is atende ladronisia of car y cu is wordo calling team autodiefstallen (nota of red: team for ladronicia of auto). the is tell also cu is bay arise one team for ladronisia of cas. according his declaracion the cantidad of ladronisia comun is alarming y can tell cu more of 600 is casonan of ladronisia at home, cu is 50% of the cantidad registra. ORANGE CITY - Dennis Oduber and Juan Carlos Calderon are both sentenced to three years in prison. This court agrees with the requirement of the Public Prosecutor (OM). The verdict came yesterday after last week the case was handled. 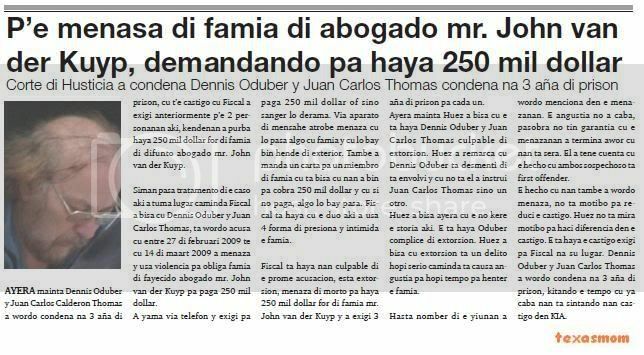 During treatment, the prosecutor that jeweler Oduber and his henchman Thomas between February 27 and March 14 this year the families of the deceased lawyer John van der Kuyps would have tried to presses. The family would pressure the two are put at 250,000 dollars to pay. Oduber and Thomas would have called family and said that there had to be paid, would hire assassins from abroad are transferred. Messages were also left in the answering of the family and a letter. Oduber made in its statement, however, are not involved in the Thomas case and that someone else would have instructed the family to presses. The court said the verdict in this story not to believe. Despite taking into account that both Oduber as Thomas had no criminal record, did the court know that extortion is a serious crime and that the suffering of the family continues because there is no guarantee that the threats will stop after Oduber and Thomas are imprisoned. The fact that the names of children were mentioned in the threats was a thorn in the eye of the judge. That Oduber and Thomas in their own words were threatened does not affect the verdict, said the judge. But both men have less of the time they already have stayed in prison KIA. Page created in 7.415 seconds with 19 queries.